Someone we loved once had Parkinson’s disease, a motor system disorder that causes severe tremors in the hands and legs, sleepless nights, loss of balance, and immense frustration for the people who have it who otherwise should be in the prime of their life. It’s so hard to convey what these people feel. 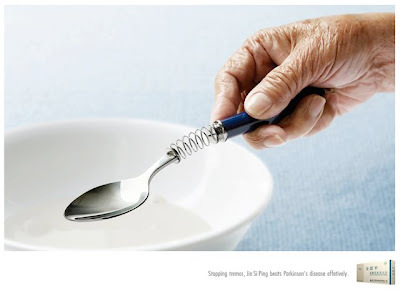 This ad does brilliantly with a single image. Work by Euro RSCG Life, Shanghai, China, via I Believe in Advertising. If you know someone with it, resources are here. Eye-catching work by Cocoon Branding of Winnipeg, Manitoba, in promoting the need to help troubled teens learn to communicate their feelings. The creative works on two levels: You get the message in a flash, and then a second look pulls you in for deeper understanding of the issue and the response mechanism. A bit gory, but brilliant. Via Ads of the World. *Angela Natividad praises J&J and TBWA/Chiat/Day/NY for this campaign encouraging young athletes to stay away from steroids. At first, we thought this was creepy — a bit of a slam on the poor kids who struggle with acne. And then we realized this is brilliant. The only way to get the message out is to have the target pay attention, and acne or skin blemishes are such a pain for teens that they’d probably tune in to this spot to see the outcome. Marrying an ugly habit with physical ugliness is a risk, but we won’t forget it. We were brainstorming with a friend from another agency today about how to start a viral campaign … you know, create the type of communication that mavens and connectors would tip into their networks, who in turn would pass it to the world, cascading us to success while saving the client media money. And it hit us. Anyone can map out the dynamic of exponential returns. But the seed has to be fertile, an idea so powerful and treatment so riveting that people want to pass it along. Sort of like this. Brilliant PSA work by filmmaker shop Shilo. Backstory here. Music is Chopin’s Nocturne C minor op. 48 no 1 and worthy of your iTunes collection. Atlanta media planner Michelle Marts has launched a killer campaign to teach motorcyclists in Florida that dressing in dark black is a good way to, um, get killed. The campaign, for the Florida Department of Highway Safety and Motor Vehicles, encourages riders to “dress loud” and get visible on the roads. We admire this, because (a) it’s a noble cause and (b) frankly will be a tough sell, fighting decades of ingrained coolness from James Dean and Dennis Hopper in black leather. More than 500 riders die on Florida roads every year, but teaching bikers to wear orange chaps will be revolutionary. Still, Austin Powers pulled it off. Come on, men. Show your true colors. Don’t buy. Really. Our cool product just isn’t for everyone. Ever notice the trend in advertising for anti-product messages? Like the above Anheuser-Busch Beeresponsible site warning you that your partying may need limits. Hmm. But don’t these people look like they’re having fun? Alcohol jumped in with public service announcements, too, but we’re starting to see a new trend — a hint at cool. The Bud site above sure looks like a good party. Taglines on the backs of beer trucks in the U.S. use modifications of the “responsible” slogan with wry twists. Cookie-makers have started an “Ad Break” flag on web sites warning kids and parents that the sites, yep, are really designed to sell cookies. So we’re watching American Idol with the kids tonight (bear with us, they want to be musicians when they grow up) and while we’re enduring this pure drivel suddenly a talented teen auditions in front of the three judges and Randy Jackson gets a weird look in his eye. We think we remember it. Under all the glitter and staging and Paula Abdul coming in late perhaps hung over, when pure talent raises its voice, the judge Jackson suddenly peers seriously, and we see a human soul acknowledging another without pretense or deceit. It lasts about 2 seconds … and then the music blares again and the nets cut to commercial break. Andy up in Vancouver posts a similar recorded incident, this one back from 1969 with the great Fred Rogers asking for PBS funding in front of a Senate subcommittee. If you watch this 6+ minute video, you’ll see Mr. Rogers wasn’t an act … he was a real guy with a quiet voice trying to help children build self-esteem. The curmudgeonly senator on the other end of the pitch softens and softens and then finally approves Rogers for millions in funding. There’s not much of this type of honesty in communications today. It works. See if you remember how to do it.